Click here for the more on the Iranian student movement and the pro-democracy demonstrations in Iran. June 17, 2003: Pictures from the assault on student dormitories in Isfahan are available from Jonbesh in Germany. According to some reports, up to seven students have been killed so far in attacks by hard-line thugs working for the regime. June 11, 2003: Hard new information on Iran's involvement in the July 1994 AMIA bombing and other terrorist attacks has prompted the Bush administration to reconsider its Iran policy, Insight magazine reports. In Buenos Aires, Judge Juan Jose Galeano has issued international arrest warrants for four Iranian officials. And an Iranian defector has come forward with documents from the Intelligence bureau of Supreme Leader Ali Khamene'i that shed new light on meetings held in Iran between top Iranian intelligence officials and two delegations from Osama Bin Laden's al Qaeda organization just months before the September 11 attacks on America. FDI makes available the original Farsi-language document and a complete English-language translation. 2) Saturday, May 31, at 2 PM, in front of the Sheraton Hotel, 1108 N. Mathilda Ave, Sunnyvale, CA (408-752-8000). 3) Sunday, June 1 at 2 PM, in front of the wyndham Hotel Orange County, 3350 Avenue of the Arts, Costa Mesa, CA (across from South Coast Plaza), 714-751-5100. May 21, 2003: former FBI director Louis Freeh writes today in the Wall Street Journal that President clinton was so eager to protect a "relationship with Iran" that he refused FBI requests to press Saudi ARabia to interview suspects in the Khobar Towers bombing in 1996. Freeh claims that he appealed to former President George H.W. Bush, who interceded with Saudi Crown Prince Abdallah to allow the interviews to proceed. The suspects directly implicated the Iranian government in the bombing. Despite their testimony, the Clinton White House blocked a federal indictment naming Iran. Freeh had to wait until June 2001, once George W. Bush became president, to issue the indictment. May 19, 2003: Brownback introduces Iran Democracy Act. Senator Sam Brownback (R, Ks) today introduced legislation that would provide funds to expand pro-democracy broadcasting into Iran, increase the amount of influence that Iranian-Americans have in the U.S. Persian radio service, Radio Farda; and provide grants for the translation of materials into Persian. The bill also promotes an internationally-monitored referendum in Iran. April 28, 2003: US forces have bombed the outlawed MEK camps in Iraq and have told MEK members to leave their camps in Iraq and disarm, prompting Capitol Hill supporters to melt away. April 24, 2003: American Enterprise Institute scholar Michael Ledeen receives a warm welcome from Iranian exiles in Los Angeles, writes Pooya Dayanim in today's National Review On-Line. Until now, Dayanim writes, dissidents in exile have never met their supporters in Washington. "It is now time for this to change." April 23, 2003: Congressman Bob Ney, who had taken $4,000 from MEK members in 1995 before their lobbying campaign was exposed by FDI, has written to the Hill newspaper denouncing the "outright lies, exaggerations and deceptions" used by the group. Ney blasts the MEK for using "dozens of pseudonyms, such as the National Council of Resistance and the People's Movement of Iran, to hide contributions and spread its propaganda" and its close ties to Saddam Hussein. Ney also blasted the group for faking its support in Congress, and said that the reason the group steadfastly refuses to publish the names of Members of Congress who signed a letter of support last November is because the list "does not exist." He goes on: "At one point, it may have; in fact, when MEK representatives first visited my office several years ago, preaching democracy for Iran, I was glad to join them in what appeared to be their effort. However, I quickly discovered that the MEK are not the proponents of democracy they claim to be but are in fact documented terrorists with a history of killing American citizens and supporting Saddam Hussein." • The opposition group Marzeporgohar reports to FDI that malicious hackers believed to be operating on behalf of the Iranian government have wiped out their website. They are now in the process of reconstituting their archives and hope to have their terrific daily news digest back up and running soon. April 22, 2003: CENTCOM spokesman Brig. Gen. Vincent Brooks tells reporters in Doha, Qatar, that the MEK troops "have moved into what can best be described as assembly areas, in a non-combat formation," as part of a coalition-negotiated ceasefire, and that for now the U.S. was treating them as enemy combattants because of their status as a terrorist group. April 21, 2003: The Washington Times reports today that the U.S. "blew up 15 to 20 tanks, numerous vehicles and pieces of artillery" at a training camp in Iraq used by the Mujahedin-e Khalq after warning MEK members they had 48 hours to leave as civilians and disperse or face attack. The MEK initially claimed their camps had come under attack from Iranian Revolutionary Guards, and even put out two press releases giving the names of alleged IRGC commanders involved in the attack. They have subsequently withdrawn the press releases from their website. April 18, 2003: The outlawed People's Mujahedin-e Khalq (MEK) flaunts U.S. law by holding a Washington, DC demonstration after taking out a 1/4 page advertizement in the Washington Post on April 17. Earlier this month, The Hill newspaper ran a detailed article on MEK lobbying efforts in the United States that have spurred an increasing number of Members of Congress to withdrew their names from a letter of support for the group. Despite the terrorism allegations from the State Department, Florida Republican Ileana Ros-Lehtinen confirms her support for the MEK. 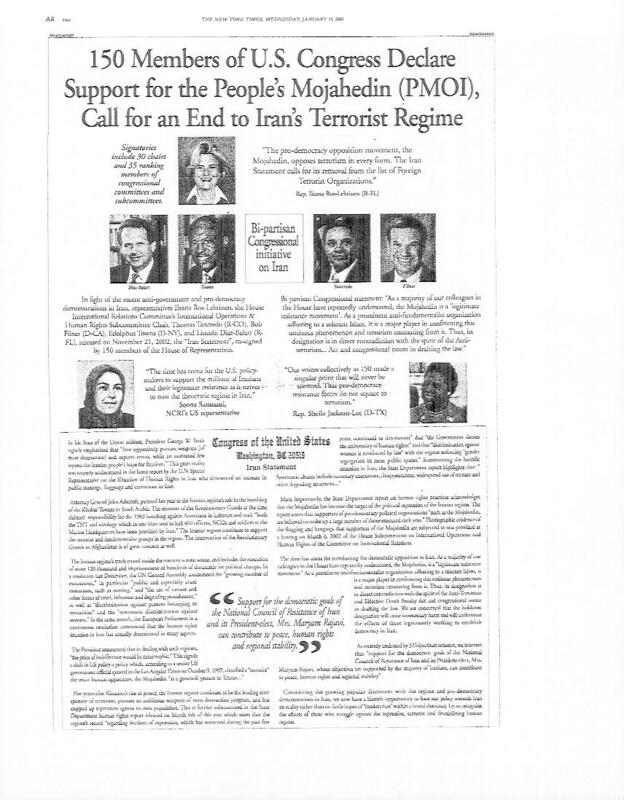 Jan. 24, 2003: The New York Times runs a full page ad in support of the MEK (Mujahedin-e Khalq), a group on the State Department's list of international terrorist organizations. Read the story. View the ad. Jan. 16, 2003: Human Rights Watch blasts Iranian "reformers" and hard-liners for toying with human right. In its annual report for 2002, HRW said "human rights progress in Iran was caught in a continuing political power struggle between popularly elected reformers... and clerical conservatives." While we object to the use of the term "conservative" to describe Ayatollah Khamenei (who is about as "conservative" as Joe Stalin,), HRW went on to note that "the reformers were unable to dislodge repressive policies favored by the clerical leadership, including far-reachin resrictions on freedom of expression, association, and political participation." The latest failure of the "reformers" came too late to be included in the HRW report. In today's Majlis session in Tehran, reformers were forced to shelve an elections bill that sought to eliminate the Council of Guardians from screening candidates for public office. As Financial Times correspondent Najmeh Bozorgmehr reported from Tehran, "If it passes the legislative hurdles this would lead to a basic change in the regime's political structure." No wonder the hard-liners wanted it deep-sixed. Oct. 15, 2002: "Do not listen to the growing number of organizations like the American-Iranian Council [AIC]," writes Farideh Tehrani, a 27-year old doctoral candidate in Tehran, in the latest issue of National Review. "The AIC and its sister groups are nothing more than circuitously funded lobby groups pushing the interest of the Islamic Republic." Ms. Tehrani also blasts journalist Robin Wright for her unqualified support of President Khatami. "You quote his liberal speeches in Europe, yet are deafeningly silent about his televised speeches in Iran, declaring: "Those who abide by the Quran must mobilize to kill." To us as Iranians, that is unfathomable. Don't you realize that when we read your work, we ask what good is free press if it does not report the truth?" (Local copy). Oct. 1, 2002: Michael Rubin, advocate of Iranian freedom, becomes Iran-Iraq director at the Pentagon. Visiting scholar at the American Enterprise institute and regular commentator in the Wall Street Journal and elsewhere, Rubin will now be in charge of the Pentagon's programs to help the Iranian and Iraqi people in their march toward freedom. In a speech earlier this month in Los angeles, where Rubin excoriated the cleric regime in Tehran, he also condemned American reporters such as the Los Angeles Times' Robin Wright who "misrepresent human rights in Iran." Sept. 20, 2002: Torricelli abandons the MEK. U.S. Senator from New Jersey Robert Torricelli has finally backed off his support of the People's Mujahedin Organization of Iran (also known as the Mujahedin-e Khalq, or MEK). Challenged to return campaign donations from Mujahedin supporters by Republican challenger Douglas Forrester in a campaign debate on September 12, Torricelli initially scoffed. But as the local press in New Jersey uncovered the details of Torricelli's long-standing ties to the MEK, the "Torch" began back-peddling rapidly. "At this point, it's just not productive to continue with this," Torricelli told the Star-Ledger newspaper in New Jersey on Sept. 13. "If the organization is engaging in activities against civilians that are of terrorist nature, the State Department has every right to ban their activities and have no contact with them." Torricelli's money ties to the MEK were first revealed by FDI Executive Director Kenneth R. Timmerman in a January 1998 article in the American Spectator, "Torricelli's Terrorist List Friends." Timmerman updated the story for Insight Magazine on Sept. 20, 2002. Torricelli argues that he took money from MEK supporters because he agreed with their declared objective of violently overthrowing the Iranian regime. And yet, on Aug. 3, 2002, as Torricelli sought campaign dollars from California businessmen, he was the keynote speaker at the American-Iranian Council at a top dollar conference initially scheduled to be held at the Beverly Hilton in Los Angeles. Iranian-American protestors, including the Mission for Establishment of Human Rights in Iran (MEHR IRAN) convinced the Beverly Hilton to bow out, and the conference was held at the Fairmount Hotel in Santa Monica. Torricelli appeared with noted "normalization" advocates Hoosang Amirahmadi, Gary Sick, Judith Kipper, and Fereidun Fesharaki amidst a crowd of Iranian-American protesters. The AIC is a pro-regime business group that supports lifting the US trade embargo on Iran and legitimizing the clerical regime. An AIC press release noted that Torricelli laid out "the necesary steps to take to open dialogue between American and Iran," while reminding listeners of the U.S. government's objections to Iranian government behavior. In an earlier address to the group last March, before he had publicly abandoned the Mujahedin, Torricelli forcefully criticized President Bush for applying the "axis of evil" designation to the Islamic Republic of Iran, as noted by the Washington Times. (See the March 15, 2002 entry below). Sept. 9, 2002: Opposition group blasts Sen. Diane Feinstein for visa sledgehammer. Marze-por Gohar,which emerged as a popular force in Iran during the July 1999 student rebellion at Tehran University, believes the U.S. should apply some intelligence to its visa policy toward Iranians. Sen. Feinstein wants to deny any Iranian citizen the possibility of traveling to the United States - with the sole exception of Iranian government officials! "The Iranian Government should not be confused with the people of Iran," the group said today in a statement. "The real enemies are the very same people who are granted the diplomatic visas, because they are directly connected to the unjust government of Iran." June 4, 2002: In a stunning development, the Russian Deputy Chief of Staff Gen. Yuri Baluyevsky told reporters in Moscow during the Bush-Putin summit that Iran has nuclear weapons. According to WorldTribune.com, Gen. Baluyevsky was asked at a June 1 press conference whether Iran had recently test-fired the Shihab-3 intermediate-range missile, and whether Iran could threaten Israel, Russia or the United States with its nuclear and missile programs. Baluyevsky began by asserting that Iran and Russia have broad and concrete economic cooperation consistent with the requirements applied to the non-proliferation of missile technologies and weapons of mass destruction. Then he took a surprising turn: "Now, as to whether or not Iran has tested something like that. Iran does have nuclear weapons," Baluyevsky said. "Of course, these are non-strategic nuclear weapons. I mean these are not ICBMs with a range of more than 5,500 kilometers and more. But as a military man, I see no danger of aggression against Russia by Iran. As for the danger of Iran's attack on the United States, the danger is zero." May 7, 2002: After kicking the United States off the Human Rights Commission last year, the United Nations body on April 19,. 2002 voted 20-19 to take the Islamic Republic of Iran OFF the list of human rights abusers. This is the first time in 19 years that the clerical regime has been given a clean bill of health and will not have to face a UN Human Rights Rapporteur detailing the regime's crimes against women, minorities, and political opponents. FDI has learned that the Marzepor Gohar party, a nationalist student movement, is inviting pro-democracy activists to protest the UN decision on Monday, May 13, at UN headquarters in New York between 11 AM and 2 PM (43rd street and 1st avenue). The protest will be led by Roozbeh Farahanipour, the exiled leader of the Marzepor Gohar party, himself a leader of the July 1999 student movement who was imprisoned and tortured by the regime before escaping to the West. For more details contact www.marzeporgohar.org.Read additional news coverage of the protest. March 27, 2002: Congressman Gil Gutknect (R, MN) introduces a Sense of the Congress resolution expressing "support of the people of Iran and their legitimate quest for freedom, economic opportunity, and friendship with the people of the United States." The resolution uses language FDI has frequently used to describe the rupture between the people of Iran and the "unelected officials" running the government, and urges the President of the United States "to engage with and support the people of Iran and their legitimate aspiration for freedom and democracy." FDI salutes Cong. Gutknect for his far-sightedness and urges other members of Congress to join his efforts. Click here to read the full text of the resolution, and here to visit the Gutknect website. March 26, 2002: Senator Biden's fund-raiser with pro-regime lobbyists in Los Angeles generates criticism from the chairman of the Delaware Republican party, who urges Biden to "return the campaign money and apologize to the American people for taking it in the first place, [and] especially apologize to the many Iranian-Americans living in this country who reject the Tehran regime." March 15, 2002: Top White House aide reads the riot act to pro-Tehran lobbyists. At a full-day conference of the American-Iranian Council, a pro-Tehran lobbying organization seeking to get U.S. trade sanctions on Iran lifted and to promote acceptance of the clerical regime by the United States, White House aide Zalmay Khaliazad, who has just returned from Afghanistan, delivered blistering condemnation of the Iranian regime. March 4, 2002: Biden Buddies up to Pro-Iran lobby, from Insight magazine. The Islamic Republic is seeking to widen its influence in America by hosting galas, cultural events, and lobbying Congress. Insight Magazine looks at a recent fund-raiser in Los Angeles for Sen. Biden organized by the Iranian Muslim Association of North America (IMAN), and at the forthcoming Nowruz gala on March 13 sponsored by the pro-Tehran American-Iranian Council. Similar lobbying is taking place in Europe as well, where the Islamic Republic is allegedly funding a Nowruz concern in Koln, German on March 31. Feb. 4, 2002: U.S. clarifies the case against Islamic Republic leaders. Following President Bush's State of the Union speech which identifies the clerical regime in Tehran as part of an "axis of evil," top U.S. officials have clarified and expanded the administration policy. "Iran's direct support of regional and global terrorism, and its aggressive efforts to acquire weapons of mass destruction, belie any good intentions it displayed in the days after the world's worst terrorist attacks in history," the Washington Post quotes national security adviser Condoleezza Rice last week. Secretary of Defense Donald Rumsfeld and Secretary of State Colin Powell took to the airwaves over the week-end with even more explicit remarks. "We have any number of reports that Iran has been permissive and allowed transit through their country of al Qaeda," he said on ABC's "This Week." Jan. 30, 2002: After violent clashes today between teachers and security forces in several cities across Iran, the regime has jailed more than 100 teachers. In addition to protesting low pay, teachers were protesting imposed religious courses and the segregation of school boys and girls, especially in rural areas where class space is at a premium. Nov. 12, 2001: Iran sponsors Al Qaeda terrorism. Investigative report from Insight Magazine that lays out the evidence presented recently to U.S. war-planners on Iran's involvement in the Sept. 11 attacks. Nov. 9, 2001: In "The Other Air War," from today's Wall Street Journal, FDI Director Kenneth Timmerman argues that Congress needs to conduct vigilant oversight in creating a new Radio Free Afghanistan to ensure that the mistakes of Radio Free Iran are not repeated. He suggests that Congress demand regular transcripts in English of the radio broadcasts to ensure they stay on message (For a local version, click here). National Review on-line quoted Timmerman earlier on how political appointees have transformed Radio Free Iran into "Radio Khatami." Nov. 1, 2001: As Iran's President Khatami comes to New York on the 22nd anniversary of the U.S. embassy takeover in Tehran, FDI Executive Director Kenneth Timmerman reveals that Iran is harboring two of America's Most Wanted and says: Mr Khatami, Hand Them Over! For a local version of Ken's oped in today's Washington Times, click here. FDI has also received a statement on Khatami's upcoming visit from the Marzepor Gohar party, a recently-formed group based inside Iran that played a leading role in the July 1999 student uprising. The party urges the U.S. to make "No Alliance With the Terrorist Regime in Iran." American Enterprise Institute scholar Michael Ledeen, writing in the Wall Street Journal on Oct. 31, believes the ongoing anti-regime demonstrations in Iran, which have been widely ignored by the Western press, constitute "an event of world-historical potential" that are "unprecedented in the history of the Islamic Republic." Oct 28, 2001. Iranian human rights activist Parvin Darabi slams CNN reporter Christiane Amanpour for hypocritical testimony "about the greatness of Islam." Darabi's sister, Iranian pediatrician Dr. Homa Darabi, died after setting herself on fire on Feb. 22, 1994 to protest repressive policies against women by the Iranian government in the name of "Islam." Oct 16, 2001: The Washington Post today reported disturbing information about a problem I have tracked for years: an Iranian-government-back school in Potomac, Maryland, where young people are being taught to hate America and to hate Jews. For background on the group financing this "Islamic" school, see my Dec. 1995 article from The American Spectator, "Islamic Iran's American Base." Oct. 4, 2001: WorldNetDaily editor David Kupelian, in a column appearing today, argues that we could lose the war against terrorism because of political correctness here in America. This is a must-read column. In addition to David's accurate portrayal of the sliding scale in Islam from peace to violence, note the incredible internal memo from the news director at Reuter News Agency, who banned reporters from using the "T-word" to describe those responsible for the September 11 attacks. David also includes a hot-link to an article by one of the best analysts of modern-day Islam, Daniel Pipes, which is well worth reading as well. June 14, 2001: Should the United States renew the Iran Libya Sanctions Act? Yes, Ken argues in this week's Insight Magazine, because Iran's radical Islamic fundamentalist regime poses a direct threat to the United States and its allies. May 25, 2001: A poll taken recently on Iran's upcoming presidential election by Entekhab.net showed President Khatami leading the other nine contenders but failing to win a majority of support. Nearly 30% of the 14,863 respondents said they planned to boycott the election. Khatami led the poll with 46.7% of favorable opinions, with former Defense Minister Rear Admiral Ali Shamkhani coming in second, with 18.1% of those polled. March 28, 2001: Iranian journalist Camelia E. Fard reports on her arrest in Tehran for research she had done on "temporary marriages" in the Shiite holy city of Qom. In a feature article in the Village Voice, Fard describes prison conditions, but even more importantly, provides an inside glimpse into the underworld of legalized prostitution rings, run by ruling clerics in Iran's holiest city. March 11, 2001: Authorities in Tehran today arrested 20 political activists taking part in a meeting at the house of Mohammad Basteh-Negar, the son-in-law of Grand Ayatollah Taleghani. The arrests were ordered by the Tehran Revolutionary Court-Branch 26, and occured shortly after President Khatami defended his reform program in a speech before Parliament. Those arrested had been meeting regularly since 1984, according to Human Rights Watch in New York, which issued a statement calling for their release on March 13. Widely viewed as Khatami supporters and not outright opponents of clerical rule, those arrested included Ahmad Zeid-Abadi, a prominent journalist already facing charges for his writing, Ali Reza Rajaei, a Majlis candidate who was barred from the elections last year by the fundamentalist Council of Guardians, Dr. Habibollah Peiman and his wife, Marzieh Mortazi, leaders of the Militant Islamic Fighters party and Fatemeh Govaraei and Taghi Rahmani, both journalists. March 1, 2001:Mujahedin fund-raising ring leaders arrested: The FBI arrested 7 members of the People's Mujahedin Organization of Iran (PMOI) at Los Angeles International airport on Feb. 28, on charges of illegal fund-raising for a terrorist organization. The PMOI, also known as the Mujahedin-e Khalq (MEK), was using a fake human rights organization as a front for funding military activities in Iraq. According to FBI witnesses inside the fund-raising network, all the money raised for unsuspecting travelers and from Iranian-Americans was shipped to Turkey and the United Arab Emirates to buy military equipment for the group's National Liberal Army, based in Iraq. Jan. 2, 2001: In yet another blow to the credibility of the Islamic Republic, a U.S. District Court in Washington, DC condemned the Ministry of Information and Security (MOIS) to pay $300 million in punitive damages to the family of slain opposition leader Cyrus Elahi, in a judgement rendered on Dec. 20, 2000. The family was awarded another $11 million in compensatory damages.FDI Director Kenneth R. Timmerman served as an expert witness for the Elahi family during the trial, and described the orchestrated MOIS campaign to assassinate political dissidents living overseas.